Birds just love these cotton perches because they give and move like branches in the wind, inspiring the impression of the birds natural environment. See below for the best deal on Trixie Cotton Perch. Big Savings on Trixie Cotton Perch! Birds just love these cotton perches because they give and move like branches in the wind, inspiring the impression of the birds natural environment. Through the twisted cable, every part of the cotton perch is strong, which exercises the birds feet. Thanks to the Trixie Cotton Perch, perching just became a whole lot more fun. There is a wire running through the centre of the rope that enables you to shape it according to individual preferences and that prevents sagging. The practical screw pieces at the ends of the perch allow you to attach to the bars of the wires in whichever position you prefer. Trixie Cotton Perch at a glance: Size S: Total length (max. rope length, (with plastic attachment): approx. 37.5cm Rope length (no plastic attachment): approx. 31cm Rope thickness: diameter 16mm Variable attachment placement, max. distance: L 35cm For bars that are max. 3.5mm thick Suitable for: budgies or canaries Size M: Total length (max. rope length, (with plastic attachment): approx. 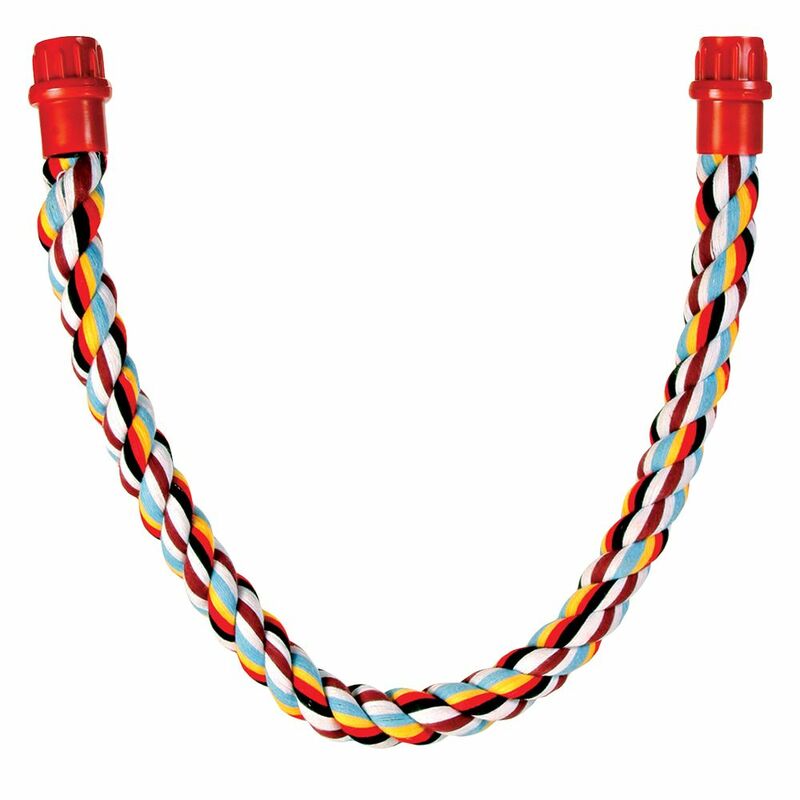 66cm Rope length (no plastic attachment): approx. 56.5cm Rope thickness: diameter 18mm Variable attachment placement, max. distance: L 62cm For bars that are max. 6mm thick Suitable for: cockatiels or small parrots Please note: Colour may differ from illustration. Birds just love these cotton perches because they give and move like branches in the wind, inspiring.. The Best Deals online for Trixie Cotton Perch and your essential Pet Supply Products. Order over £29 and get FREE DELIVERY on all orders today. Most orders are processed and dispatched within 24 hours from this supplier (zooplus) and their delivery service partners provide online parcel tracking facilities, active from 2-3 days after dispatch of your Trixie Cotton Perch order. The suplier 'zooplus' offers International shipping to the countries listed in the table below for shipping on Trixie Cotton Perch. Trixie Cotton Perch requires a £2.99 Delivery Fee from the supplier for deliveries within Great Britain. Orders over £29 qualify for Free Delivery. This can be checked using shipping calculator to your post code on the suppliers web site when purchasing.